This is the most amazing Guacamole! This guacamole recipe features fresh avocados mashed and loaded with tomatoes, red onions, lime juice, and jalapenos. This recipe is also flavored with fresh herbs and spices, which makes this guacamole out of the world. As much as I love getting creative and sharing original and unique recipes, I also love to make classics. 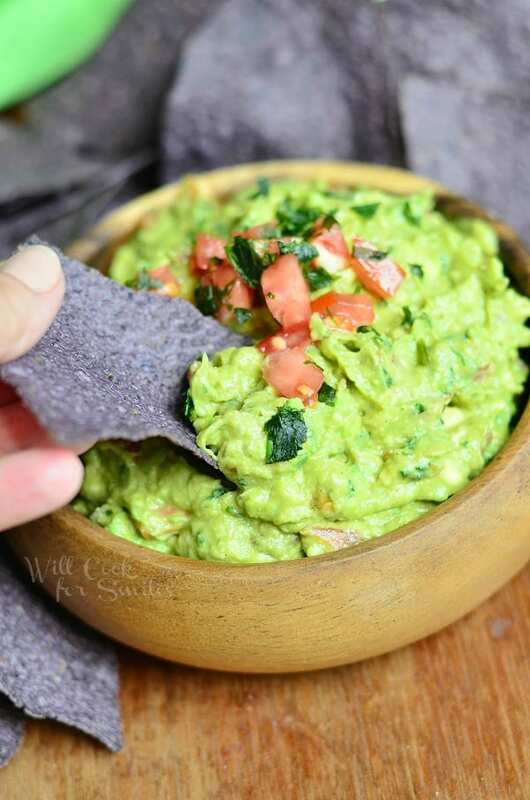 Guacamole is one of my favorite classic dips. It’s ready in about five minutes, it’s healthy and so delicious! I’ve played around with this this guacamole recipe for the last couple of years and this one is a winner in my book. 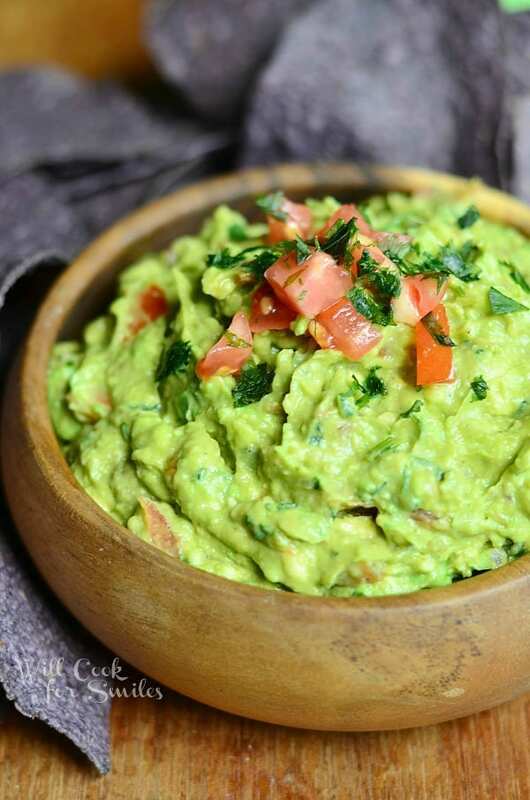 Two key ingredients that make this guacamole amazing are fresh cilantro and cumin. Both add so much flavor to the dip. I know many people like to have their guacamole plain, simply avocado, and some lime juice. But it’s just so much better with a pop of flavor from red onion, tomatoes, jalapeno, spices, and herbs. Mashed avocado is just a mashed avocado without all the extra veggies, herbs, and spices in it. So don’t be afraid to add more flavor. Avocado – Select ripe avocados. You’re looking for darker green color with some wrinkles but not deep wrinkles. A ripe avocado aslo yields when you gently press it. If it yields too easily, the avocado is over-ripe. Tomatoes – choose tomatoes on a vine, they have the best aroma and the freshest taste. Make sure tomatoes are not too soft or it will be hard to dice. Red Onion – red onions have a great hint of sweetness and adds a little crunch to the guacamole. Jalapenos – you can adjust heat level with jalapenos. If you want spicier guacamole, use jalapenos that have some veins in the skin and add the seeds. Choose smooth, firm jalapenos for less heat and discard the seeds. Lime juice – fresh lime juice makes guacamole what it is. Choose nicely ripe lime and you will get more juice out of it. Chili powder, cumin, salt – this is where my guacamole beats out the competition, the seasoning. Choose chipotle chili powder for extra smokey flavor. Adding cumin with chili powder brings out a lot of flavors in guacamole. The key to storing guacamole is keeping it air-tight because once avocados hit air, they start to turn brown within minutes. Lime juice and air-tight covering will help keep your guacamole fresh longer. I don’t know if there is true science behind it but in my personal experience, I found that storing it in a glass container is better than a plastic container. So I recommend storing guacamole in a glass bowl or glass food storage container. Transfer mixed guacamole into a glass container and give it another squeeze of lime juice over the top. Try to get the lime juice evenly all over the top. Cover with a sheet of plastic wrap flash with the top of guacamole. Plastic wrap should be touching the top of guacamole to create a barrier between guacamole and the air. 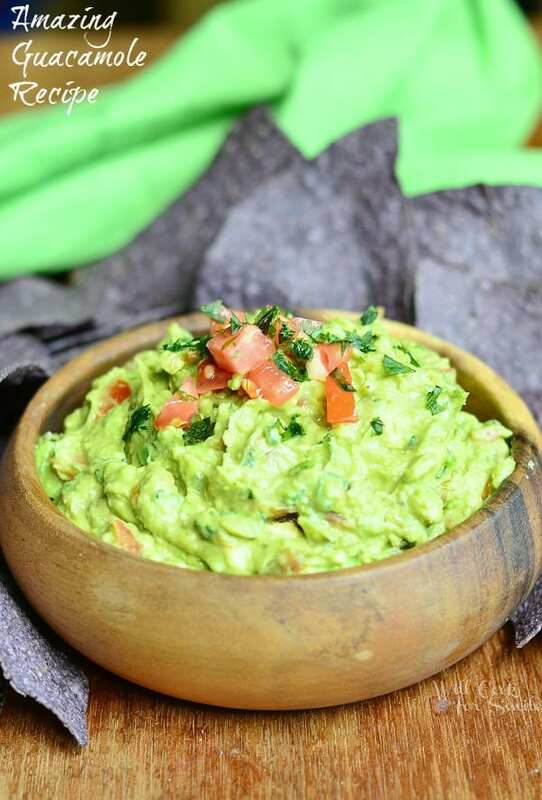 Dip – Uses for guacamole are virtually endless but the most classic way it a dip. 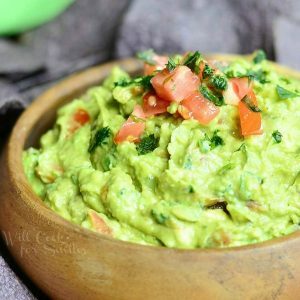 Topping – Top your favorite taco recipes with a dollop of guacamole. Spread – Burgers and sandwiches can also benefit from an addition of fresh guacamole. Much like this delightful Shrimp Burger. Nachos – Don’t forget about nachos! Crispy tortilla chips piled high with chicken, beef, cheese and veggies can only be better with some guacamole. 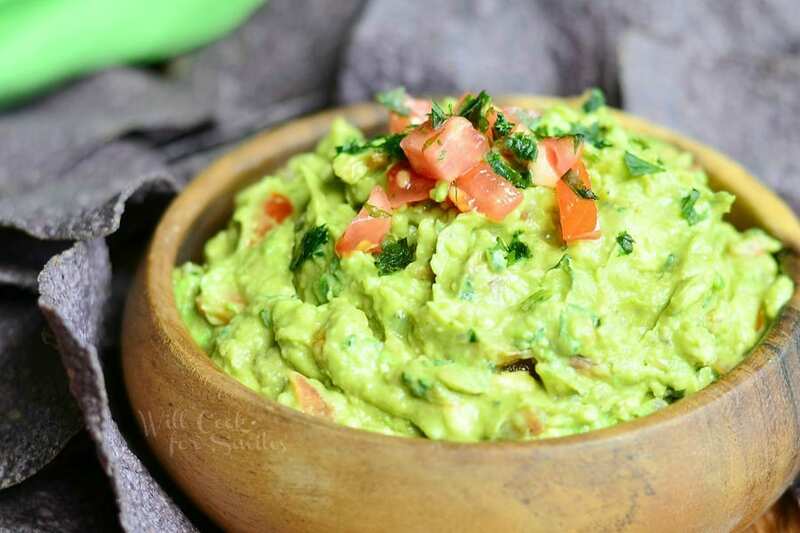 This guacamole recipe features fresh avocados mashed and loaded with tomatoes, red onions, and jalapenos, lime juice, and spices. Transfer into a bowl and wrap tightly with saran wrap. Refrigerate until ready to serve. Originally published on Will Cook For Smiles on August 13, 2014. Updated 4/23/2019. Lyuba! This is Ah-Ma-Zing!! Love guacamole with cilantro but the addition of cumin sounds really good too. You can’t beat classic guacamole! This looks perfect! I love the addition of cumin, sounds delicious! I have a recipe very similar to this and it IS DELICIOUS! One ingredient we added to the recipe was some grilled in butter pineapple! I cooked some in a black cast iron pan and then chopped it up and added it to the mix. FANTASTIC! Made this today to go with my nachos for Super Bowl Sunday. Came out excellent!! Thanks for the recipe!! I’m so happy to hear that, Steve! 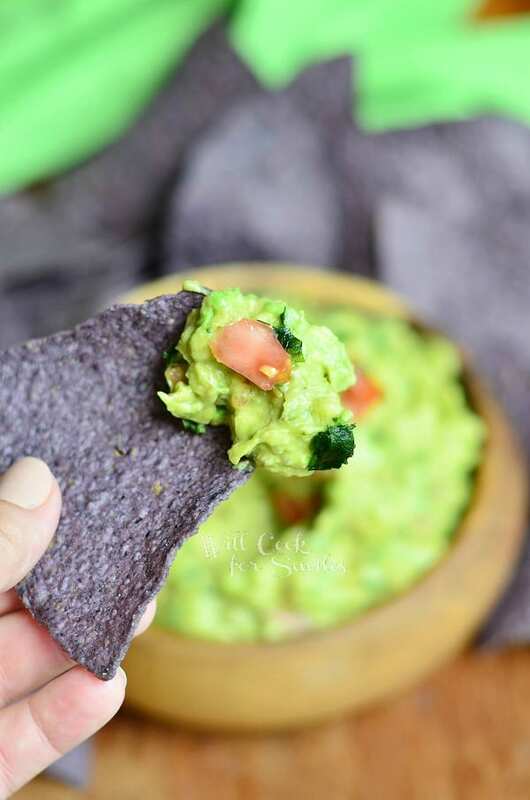 We love guac – I can’t wait to try your version! Yum!! I could live on guacamole! Delicious!